The Easter holiday offers plenty for one to celebrate, even if you’re not religious. First off, it caps off a long weekend, which means you’re probably more well-rested than the previous week. Second, it means you get a plethora of restaurants around Singapore offering one-day-only buffets designed to please the whole family. We’ve listed down a handful of our favourites so you can get to booking in advance, because trust us, these can get pretty crowded. Also, a note to parents: leave the kids home. Most of these come with free-flow booze options that are best enjoyed child-free. You’ll thank yourself for letting just a tad loose. 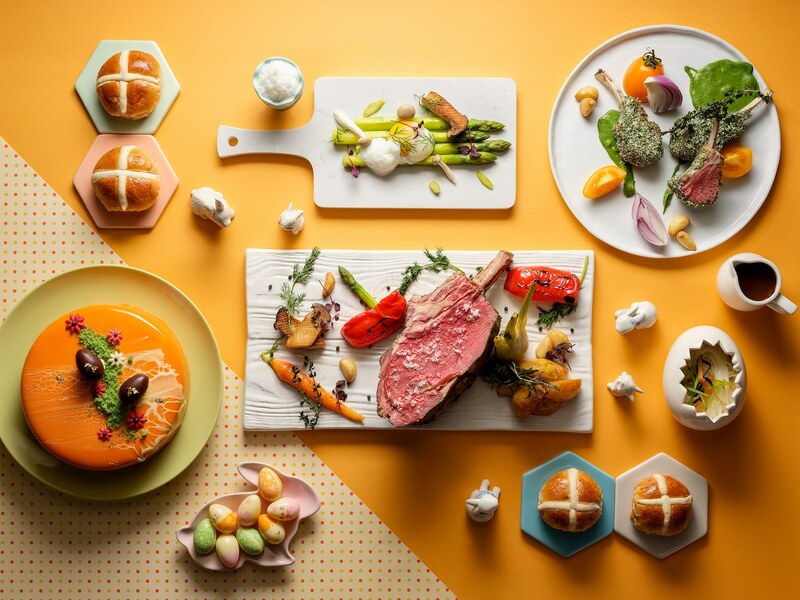 One-Ninety Restaurant at the Four Seasons Hotel brings food and fun for the whole family on Easter Sunday. A premium seafood spread stands alongside ten hot mains and live cooking stations that tout smoked Peking duck, slow-roasted meats and more will satisfy your savoury cravings, as 20 kinds of cheese and desserts will assuage your sweet ones. Activities for your children, including face-painting and egg hunts will be available in the vicinity, so you can have the young ones off your hands as you reach for another serving of caviar and champagne. Raise a toast to the long weekend with an unlimited flow of Veuve Cliquot champagne with a side of brunch at Pan Pacific Hotel Singapore's Edge restaurant. Line your stomach with fresh seafood, juicy meats from the carvery and hot bites that include their signature shellfish risotto just so you can pump in more bubbly because moderation must be absent at such an indulgent affair. For entertainment, an Easter bunny will be travelling the circuit of tables to snap pictures with your family or friends. Remember to keep that booze flush in check. Racines combines classic French fare and Chinese staples at its Easter Sunday buffet. Tomahawk steaks hot from the carvery, seared scallops and wagyu briskets are some of the offerings that will tantalise on the Western front, though if Asian flavours are more of your persuasion, then there are equally moreish deep-fried barramundis, Shanghai noodles and crispy duck being pushed out from the open kitchen. To round off the gut-busting meal, the hotel's dessert chef will prepare a selection of festive sweet treats, including croissant waffles. Don't bother counting calories that day. British staples get the Gordon Ramsay treatment this Easter at the celebrity chef's local outpost, Bread Street Kitchen. Hearty fare that spans mushroom flatbread with spinach and cream cheese, roast with Yorkshire pudding and such will warm both stomach and heart as you tuck in with your loved ones. Parkroyal on Pickering reworks its Super Lunch Sunday for the Easter weekend by expanding an array of egg-focused bites to accompany its usual sprawling buffet spread. These aren't omelettes and sunny-side-up eggs, but dishes with depth — Turkish baked fish with eggs and Scotch quail eggs with hollandaise are just a couple we'll name drop.